Classes are a “No Obedience” Zone! Great for shy, fearful and reactive dogs. Burns off physical energy for those dogs with high energy, and mental energy for those dogs that need something to do. Your dog will learn to search for these odors in 4 different search "elements": container searches, interior room searches, exterior area searches and vehicle searches (exterior of the vehicles only- not inside). How far you go with our classes is up to you- many of my students continue to get the training to compete in trials, but many just come because they and their dogs have so much fun in class. Flat collar/Harness. No pinch or choke collars. 6’ Leash: Also bring a 20’ plus long line. No retractible leashes. Treats: HIGH VALUE treats and toys! Bring LOTS of soft treats cut into small pieces. We recommend roasted chicken, hot dogs, liverwurst or cubed cheese. The stronger the odor the better. Please DO NOT bring hard crunchy treats. In this first session of classes, we introduce you and your dog to the scenting game by using your dog’s choice of motivator— whether it’s high value treats or a high value toy. Your dog is taught to search boxes for his high value motivator. We then add some challenges and more fun to the game including adding a multitude of objects and varying heights. This series of classes are held indoors. This session of foundation classes is what we build on to hone your dog’s searching skills. What kind of collar do you use? Was your dog crate trained? How many hours spent with your dog daily? Is your dog walked or exercised every day? Have you completed any dog obedience class before? If so, with whom, and when? 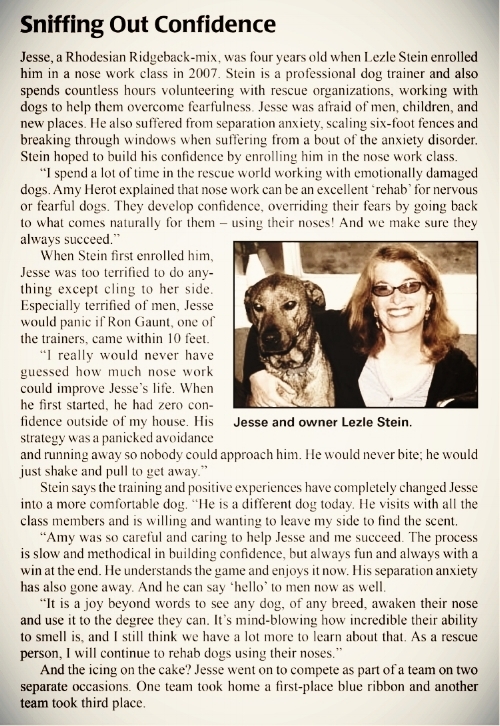 Continue to strengthen your dog’s searching skills by building on the foundation started in Introduction to Scent Work. The stronger your dog’s skills are at this level, the easier it will be to transition to an odor and the more success your dog will have if you intend to compete. If your dog is faced with searches that are too challenging at higher levels of scent work, bringing him back to the base exercises taught during the Levels 1 & 2 foundation work will give him the self-confidence and motivation to move forward and be successful. This session of classes will also introduce the dogs to bringing the search game outdoors to exterior searches. PRE-REQUISITE: Class prerequisites and Completion of Introduction to Scent Work or instructor approval. This session advances your dog’s scent discrimination skills taught in both of the previous levels. Dogs are taught to identify anise, a natural essential oil. We go back to the foundation work but using the scent as the target search objective and continuing to strengthen the foundation skills but will be adding vehicle searches, outside searches & in the ground searches, weather permitting.